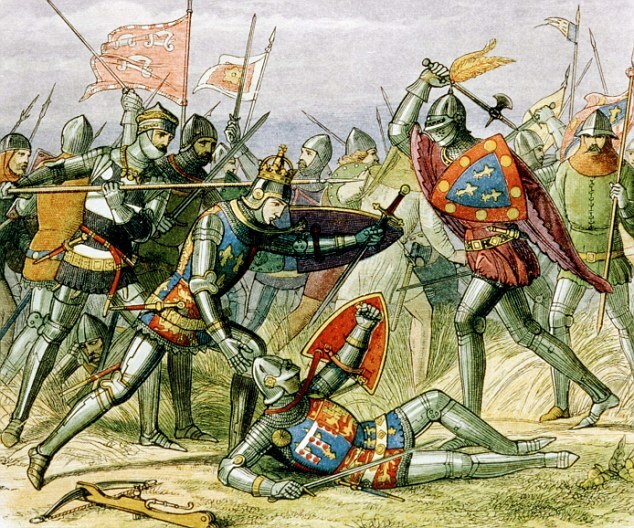 ONCE UPON A TIME, 600 years ago, we had the Battle of Agincourt. Yes, another anniversary and this was on the 25th October 1415 to be exact (okay, sorry, I’m a week late, it was last Sunday). A great victory by the English under Henry V based on a change of tactics (sort of). 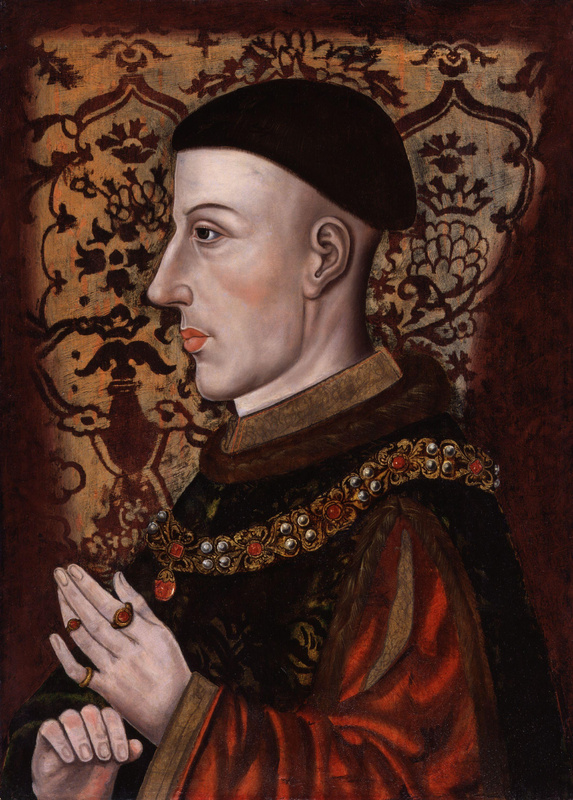 Henry’s army landed in France on the 13th August 1415. They were not, as someone suggested to me the other day, transported by his famous ship the Grace Dieu (whose remains are still beneath the River Hamble at Burseledon near Southampton) as she was launched in 1418, or by Henry’s other famous ship, the Holigost (whose remains have just recently been discovered some 50 yard from the Grace Dieu), as she was launched in November 1415. Early medieval battle tactics were simply a head-on charge of heavily armoured horseman followed by a gruesome and savage hand-to hand combat. Aka the chivalry and bravery of Knights in armour. Such Knights would also supply infantry to support their king’s cause in the oncoming furor. The coming of the Tudors and the use of the long bow was to change this. This is not to say Henry V invented this type of bow as it was used in England before him. The Assize of Arms of 1252 and Edward III’s declaration of 1363 encouraged ownership and early practice of the long bow as it was very difficult to use (requiring great strength/skill to pull). It was used to great effect at the Battle of Crécy in 1346 at the beginning of the Hundred Years’ War (which actually lasted 116 years, 1337-1453, but let’s not go there) and also at Poitiers in 1356. 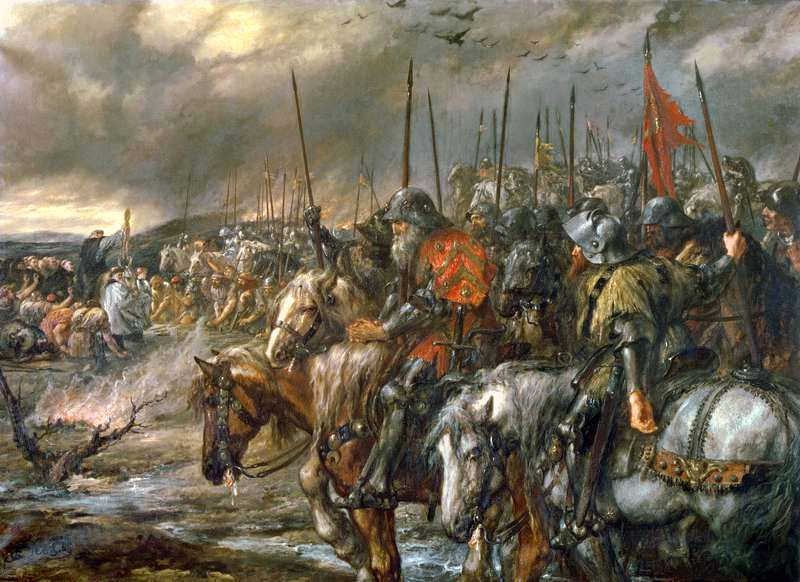 The long bow was, of course, so successful at Agincourt that it allowed a numerically inferior English (and Welsh) force of around 9,000 (which included 7,000 bowmen) to defeat a French force of around 12,000. There does not appear to be any reliable sources on causalities but it is understood the French losses were high whereas English losses were very low – one account suggests 450 English to 4,000 French. Included in the English fatalities was Edward of Norwich, the Duke of York. Obviously the English were led by their king, Henry, but the French were not troubled by their monarch, Charles VI, as he suffered from a severe psychotic illnesses – that was his excuse anyway (we’ll call him ‘sick-note Charlie’). 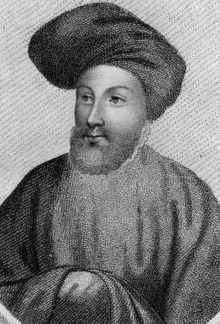 The French were therefore commanded by a Charles D’Albret. The battlefield was possibly the most significant factor in deciding the outcome. The land had been recently ploughed and was hemmed in by dense woodland. This favoured the English both because of its narrowness and the thick mud through which the French knights had to pass over making advancement very slow. It also meant that “the living fell on top of the dead, and others falling on top of the living were killed as well” (Gesta Henrici Quinti – anonymous contemporary account). In fact, the French were so tightly packed they could hardly use their swords (account by a French monk, St Denis). Interestingly the French bowmen seemed to play very little part in the battle. They had been deployed behind the French troops. The French delayed the attack expecting more troops to join them. 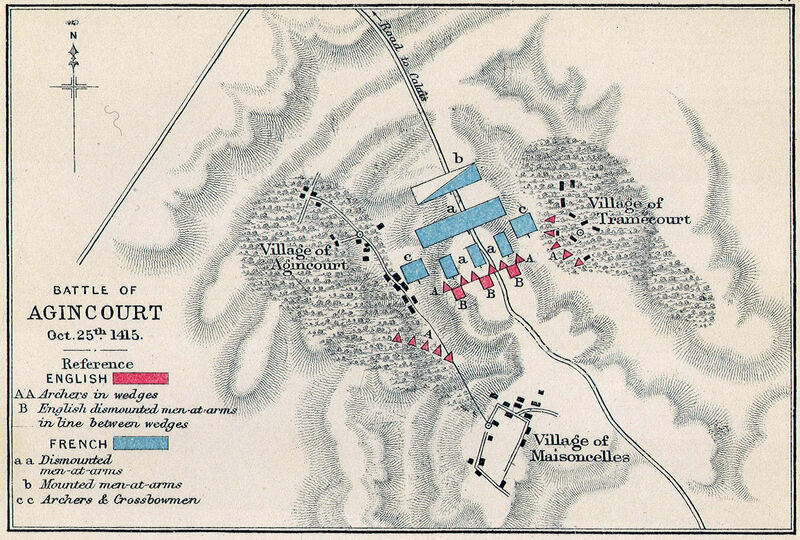 This gave the English archers time to set up their defensive stakes and by the time the French horsemen charged the English bowmen were ready for them. The French Knights could not outflank the bowmen because of the surrounding woodland, instead they headed into a ‘woodland’ of sharpened stakes embedded into the ground. Not a good option. These stakes caused much injury to the French horses who, in turn, panicked and unseated many of their riders into the mud to be left to the mercy of the English infantry. Once a heavily armoured knight was stuck in the mud he wasn’t going anywhere! Retreating French horses and horseman ran over advancing French infantry, trampling or scattering them. It was chaos. When the English bowmen ran out of arrows they simple grabbed whatever weapon they had and attacked the French men-at arms. By this time armour had become more of a disadvantage – knights were hot and tired within these armoured suits and could “scarcely lift their weapons” (see St Denis above). 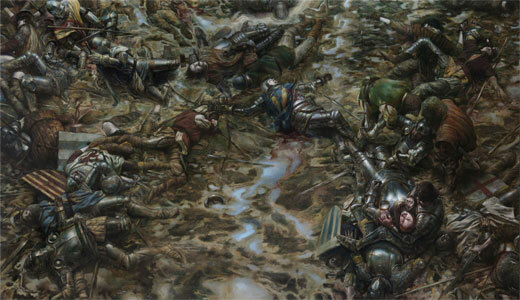 They had great difficulty in defending themselves against the much more nimble and lightly armoured English bowmen. According to one source, Henry, in rescuing his brother, Humphrey, Duke of Gloucester, received an axe blow to his helmeted head, knocking off a piece of his crown. So, clearly he was right in the thick of it, not like the French king, ‘sick-note Charlie’. Henry rescuing his brother ….. The battle lasted some three hours. Thanks Dudley. This could not go without commentary. Absolutely. And thanks for reminding me William. Which of us has not had a go at the long bow in the Mary Rose Museum?! And Sarah and I were lucky enough to handle the real thing (see post March 21).